3. Ratings info on the right hand side is not functional yet. 5. Going and field size can be changed to cater for changes (i.e. heavy rain, glut of non-runners) - NOTE> Soft ground now, so change going to soft at York! PLEASE NOTE - If you are reviewing this page AFTER racing, the grids are updated in real time as the results come in. That means there's more likely to be a correlation between the winner featuring highly in the grid. Hope that makes sense. Brilliant stuff – here’s hoping we get some winners!! I think the form of the RAR has been ‘franked’ with Mal’s and Tony’s comments above. Visiting the Geegeez site is like being a kid in a sweet shop. PS Number Theory and Oriental Fox look interesting e/w tickles…especially Oriental Fox, since he looks competitively handicapped. I’ve backed Oriental Fox, Martin, after my ‘Ebor man’, Scottish Paul, tipped it to me. He’s picked two 25/1 winners in recent years, and is some sort of judge on such matters! I really don’t like nor understand this format. It won’t be for everyone, Dion, but there will be plenty of explanations when they’re finished, so you may (or may not!) change your mind then. Fingers crossed for the Fox in 3.50…Matt. The ground has really turned, and living in Leeds I’m not surprised since there was quite a bit of rain about last night…although its not raining now. Judging by the number of NRs across the York card this morning ,it seems quite a few trainers were expecting fast ground for today’s racing…probably like everyone else. Am I being thicker than scotch broth ? I cant see any data only the first line of each race ? You might need to reload the page, Phill. It does very occasionally do that. Keep up the good work. I am new to the site but wont bet without you now! Superb innovations Matt. The idea that can you input going changes and field size and get an instant update is great. Your site goes from strength to strength and puts the Racing Post’s antiquated, self-serving effort to shame. This has come at the right time for me personally as I am having a pretty poor flat season this year as opposed to an excellent one last year. Three to avoid today (as I have them in doubles and trebles) : Mayfield Girl 16/1, Boots and Spurs 33/1 and Mister Music 16/1. 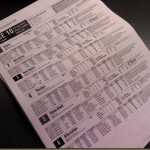 Been away and missed the start to this, looks magic in terms of saving masses of time is it available for all races. Smooth driving with these traffic lights. 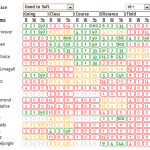 The grids are updated as the results come in, so if you’re looking after the race, they’ll look slightly better for the winner and placed horses (on the placed grid), and slightly worse for unplaced nags. This looks VERY promising! When is it expected to be fully operating Matt? Matt is this getting put up for today, Sunday 25th. Very interesting bit of kit. Sorry, it was just a ‘taster’ yesterday. The report is not ready yet, with a few things still to resolve. But hopefully from next weekend, with a favourable wind. Thanks for your interest, and glad you like it. 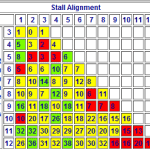 I think your Traffic Light Charts are one of the best racing aides I have came across. Hope you get them online fulltime asap. Thanks for all your hard work and info. Hi Matt, I’ve been overseas and just catching up on this. Where are the analysis sheets posted? Is there an overall explanation post? Can’t find it. An incredible first 2 days for the new RAR’s. If this sort of level of consistency can be maintained, we at Geegeez will have lot to be thankful for in the future. The charts are OUTSTANDING. Best bit of kit I`ve seen for ages. Please keep us updated Matt. Well done again. This looks great Race Analysis Reports,..
Would you please send me details,.